With a wide selection of fun games, lots of delicious food, children playing everywhere, and even a visit from Wonder Woman and Batman, the 2018 Westmead Children’s Hospital Radiothon had all the appearance of a carnival. Behind all of the good times and laughter, however, lay the serious goal of bringing a community together to ensure that children suffering from debilitating and deadly diseases still have a place to rest, recuperate, and, hopefully, recover. The Pherrus Foundation was proud to participate in such a terrific event that brought smiles to the faces of children and bringing resources to one of the country’s finest children’s health institutions. The Radiothon benefits the Children’s Hospital at Westmead, the largest health care institution in New South Wales that specifically treats seriously ill children. Using the “bandaged bear” as its mascot, the hospital goes out into the community to advocate for better child health while conducting groundbreaking research that will help save lives in the future while also caring for ill children today. The annual radiothon is crucial in ensuring that the Children’s Hospital at Westmead will continue to serve the needs of pediatric care and research. Fortunately, when organisers called, the community responded. Radiothon planners set a goal of $4 million but happily raised $400,000 more than expected. 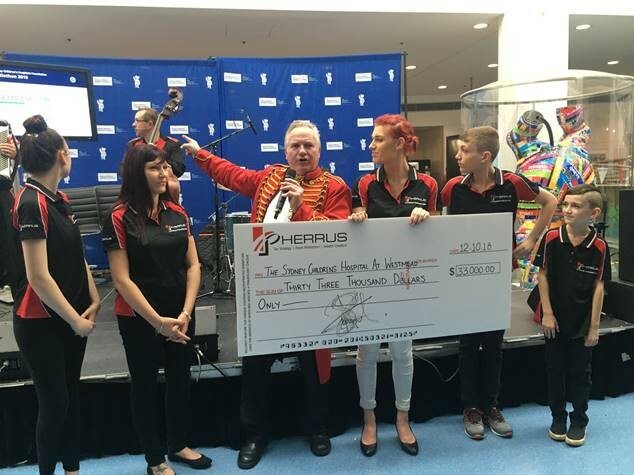 The Pherrus Foundation proudly added a $33,000 donation to help the radiothon exceed its goals. Pherrus Financial has spent years providing Sydney and the surrounding region with the most expert tax preparation and financial services. With a solid reputation and strong client base, we found it only natural to give back by establishing a foundation that supports a wide range of philanthropic efforts. Most companies that have done the same have found that giving back is good business. At Pherrus, we simply believe that it is the right thing to do. Our philanthropic efforts go far beyond supporting pediatric health in the Sydney region. Last year, our team took Santa Claus and his helpers to meet the children of Fiji’s Dilkusha Children’s Home. Santa brought enough presents for everyone along with delicious food and plenty of memorable good times. Five months later, the Pherrus Foundation returned with the Easter Bunny to help the children celebrate again. We also travelled to Suva to bring food and supplies to an orphanage there. Closer to home, the Pherrus Foundation participated in the ninth annual Chocolate Ball in Sydney. While scrumptious chocolate dominated the menu, our priority lay in helping to support efforts to eradicate Facioscapulohumeral Dystrophy, a tragic disease that weakens muscles and debilitates those who suffer from it. Whether our team is flying to bring happy days to children in need, or boosting efforts to roll back the effects of debilitating and deadly diseases, the Pherrus Foundation will continue to do its part in supporting worthy causes that will bring brighter tomorrows to those who need them the most.